GIS of Armenian reservoirs is a standalone GIS product developed by Geocom, ltd for Armenian Rescue Service to map existing reservoirs and link respective data and images to each reservoir. The Reservoir GIS has basic GIS functions, i.e. 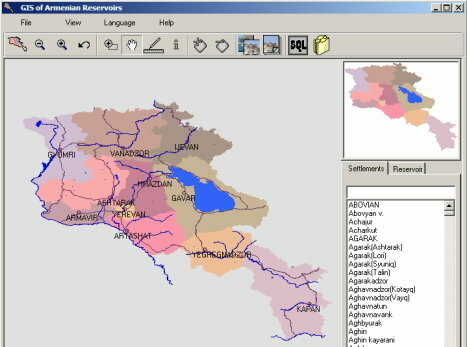 allows for cartographic search and search from attribute data on the map, zoom in/out, full extent, get info from selected cartographic objects, adding objects on the map, print, changing languages (from English to Armenian and vice versa), as well as export of data to MS Word and viewing of images related to reservoirs.